My favorite book from Paizo. This book so far has been my favorite purchase of ALL of my RPG books. I don't know if I can explain the fervor I have for this book but I will try. So first of all there is the cover, the ever feared Jabberwock(y) of Lewis Carroll legend. Having a tough SOB (CR23) on the cover is the best way to start things off I think. Lets me know im in for a ride with this book. 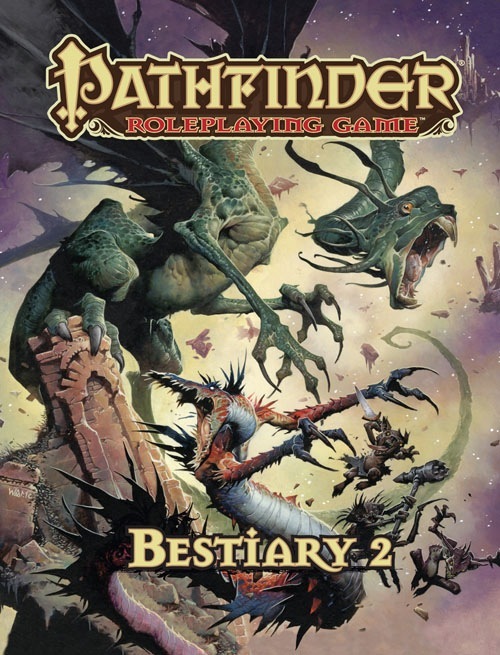 While the first Bestiary was the standard array of Monsters we have all come to know and love through years of them being reprinted for games the Bestiary 2 is where Paizo took off on its own with a whole slew of new monster and just general new ideas for monsters. A handful of new extraplanar monsters of various alignments were added such as The Aeons, Qlippoths and Daemons all have decently written history and offer a lot of inspiration for using them in games. The two things I love best about this book are as follows. One: New dragons, and not just more "coloured or metal" dragons, but a new type of dragon altogether: Primal Dragons. These bad boys have probably the best art in the whole book (magma, im looking at you) and they make for a nice change from the everyday. Two: The art, while the art in Bestiary 1 is GOOD, its not near as sharp, crisp, and detailed as this book. The colours, the textures, the everything, all done very well. You will not be disappointed when looking through this book. I really enjoyed the artwork and the monsters presented in this book, especially the Qlippoth! Must have for your pathfinder library! Looking through the PDF of Bestiary 2, I find myself remembering the days in the 1980s when I'd sit in the back of the mall bookstore and leaf through the various gaming tomes I couldn't possibly buy all of. Crystal Dragons, Aeons, and several others in this book remind of that golden era, when DMs had such a wide variety of unusual (and often new-age-y) creatures at their disposals, they couldn't possibly ever use them all. Sure, some of the creatures are a little odd, but on the other hand, the vast variety will lead to some adventurer groups with a far different list of encountered monsters than the norm. I personally can't wait to spring the Dullahan (aka Headless Horseman) and Animate Dream on my party! I do not mind the creatures in this book, but it does get less use than my other bestiary. However it still has the same problem as the first also. The use of generic rules for a creature type. For an actual hardcover book to be useful in a game (for creatures) you MUST be able to have all rules for the creature on the one page. The use of rules based on a type of creature that you need to leave the creatures page to reference is irritating and a waste of in game time. Please fix this problem. I understand that constructs all have similarities but I need the rules on each constructs page to reference. Not have to skip to the end of the book to see if they have something relevant when they need it. I find some of the artwork choices dubious and some of the stat-blocks clearly don't hold up under close examination. Also only about a third of the creature content is of current use/interest to me. Warts and all this is a pretty spiffing book, and I would cautiously recommend it. I give it a rating of four stars. Is that going to be the actual cover art? I'm liking it! Filler art. Wayne is doing the cover. oh, I cant wait. I love the first and really looking forward to the 2nd. Edit: Geez, ninjaed several times over. Guess I didn't hit refresh. I would like everyone to note that we specifically mentioned the book'll contain hippogriffs in the product text. Because we care! Yes. Hippogriffs. You will indeed get hippogriffs. For sure they will be accidentally left out of the final book due to a printer error. Just sayin'. Also, am I right that Aeons are the paragon NN race ? ...am I right that Aeons are the paragon NN race ? I love my hippogriffs. I can't even make my standard Luke Skywalker joke off of JJ's post, I'm so full of love. There's already a new CR16 kyton in Pathfinder #30, but others would be nice, too. Here's our third hardcover Pathfinder RPG book for the year! The first Bestiary was an excellent book, but due to spacial limitations it left us hungry for more. Well here's our solution! We've got a new kyton in Pathfinder #30... but no new kytons scheduled for Bestiary 2. I don't think we do, at least. BTW: why aren't kytons devils any more? And there goes some more of my hard earned money. Not all of us can afford to buy every Pathfinder product. If Paizo put out bi-yearly monstrous compendiums I'd do flips. Kytons weren't devils when originally introduced (or at least they weren't in 2e Planescape's Planes of Law box set, I dunno if they ever were around before that.) The change just returns them to the status they held before, denizens of Hell but not true devils. Ah ok, I used to ignore Planescape back then, because I found the original box set offensive in its tone and embarrassing in trying to be cool with its awful "cant" and DiTerlizzi art. Stop rattling your bone-boxes, graybeards! I'm pretty much at where I want to be with it now. And anyway, as not having a gaming group, I have no need to collect every issue of every adventure path. Bar that! Do you want to go lanning this leatherheaded Prime to the dark of it all? Actually, while there certainly ARE kytons in Hell... their main plane is the plane of Shadow in Golarion. But yeah... the weren't devils in 2nd edition when they were initially created, and even in 3rd edition, even though they were CALLED "chain devils," just look at their stats. They're not BUILT like devils. They don't have any devil traits. No spell-like abilities. They're like retrievers and bebiliths (two others who we moved out into their own entries). Really hope there will be Spellweavers in this one. Or a cool replacement monster if Paizo can´t do them (which I have no clue about). I know he ain't talkin' bout diTerlizzi! Spellweavers are not open content. I would nominate the witchwyrd from Pathfinder #14 as their "replacement." Although they're pretty different, power wise. 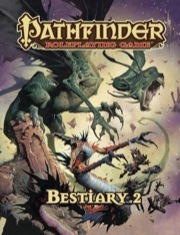 The official Bestiary 2 announcement, very, very NICE! I am glad that Wayne Reynolds is doing the cover art for this one as well. (Since there wasn't a Bestiary 1 promo poster, any chance for a Bestiary 2 promo poster?) Pretty Please...? BTW James... very glad that hippogriffs were mentioned, as well as proteans, and the aeons too. (After hearing talk of the True Neutral outsiders for a while, its nice to have a name, and knowing we'll have much more in about 8 months). Will there be any changes to the "icons" ? I liked the premise of the Bestiary vol. 1 icons, but they were sort of hard to distinguish. The icons won't be changing. Is it too late for this fellow to make the cut? That fellow? A sea life curator? Just use stats for an NPC Expert with Knowledge (Nature - sea life), and use the page-space for something more useful, such as a giant sea crab maybe? are there going to be more oni type monsters in the bestiary 2? Pike it Mona you upstart Prime! "to denizens of the outer planes like daemons"
Hi. I'm Trelmarixian the Black, Archdaemon of Famine, and I approve this message.